The High Sierra: Peaks, Passes, and Trails by R. J. Secor, 2009. This detailed and authoritative resource is essential for planning off-trail trips in the High Sierra. 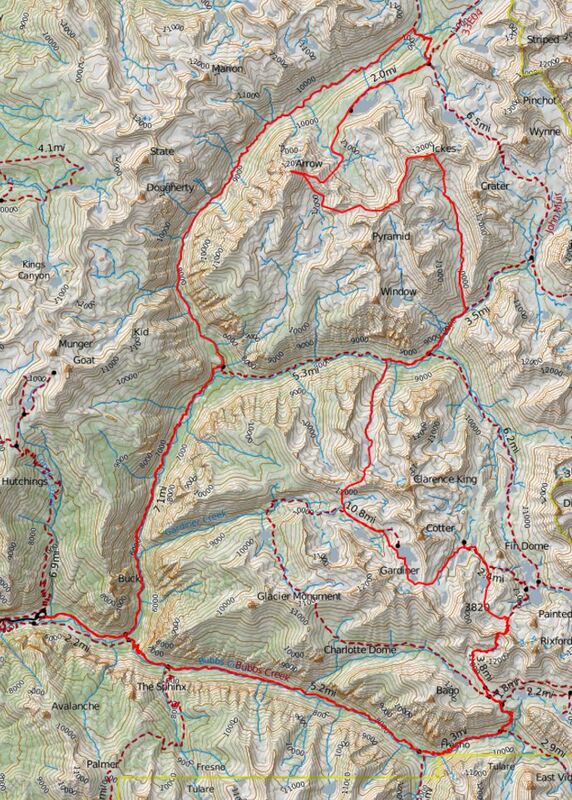 Two Harrison maps are required for this route: Kings Canyon High Country Trail Map and Kearsarge Pass Trail Map. The National Geographic Sequoia and Kings Canyon National Parks map also covers the route but at a smaller scale. We had passed through the upper end of Muro Blanco on previous trips and wanted to hike the entire canyon. We also wanted to explore White Canyon, a little known area in Kings Canyon National Park. We did not take a camera on this trip, however Richard Moshier has some nice images of the Muro Blanco at his site. Many thanks to Richard for giving us permission to use one of his photos in this article. Another five-star trip in the high Sierra. The ridgetop walk west and south from Mount Ickes was stellar; there are few ridges in this part of the range that are so easy to traverse. The White Fork canyon was straight-forward and enjoyable. The descent of Muro Blanco was very beautiful and much more enjoyable than Goddard Creek, which I’ve done twice and each time said “glad I did that once and I don’t need to do that again”. A terrific experience; I loved every piece of this trip once we left the Bubb’s Creek freeway. Muro Blanco remains one of my favorite places in Kings Canyon National Park. 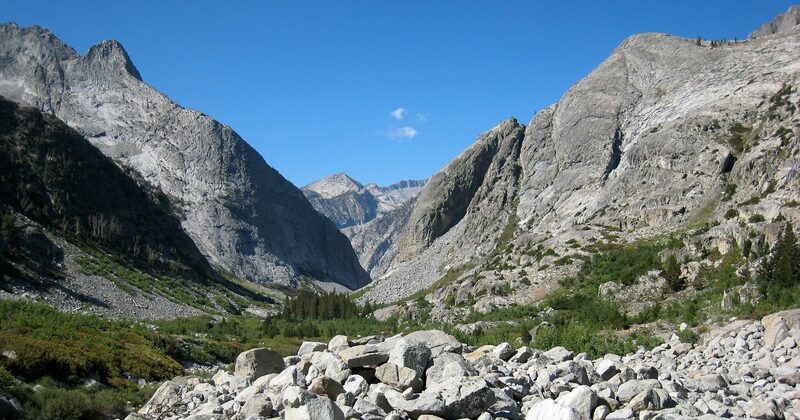 Start at Road’s End trailhead in Kings Canyon NP and take the Bubb’s Creek trail to its junction with the JMT. North on the JMT over Glen Pass. Just north of the pass, leave the trail and cross Rae Col into the south end of 60 Lakes Basin. Cross 60 Lakes Col into Gardiner Basin and follow the west shoreline of the largest Gardiner Lake. Contour northwards to King Col, the low point on the west ridge of Mt. Clarence King. Cross the col and drop to the Wood’s Creek Trail. Turn east and follow the trail to the JMT. A bit over a mile later, leave the trail and after a short easy bushwhack head up White Canyon to the ridgeline east of Mt. Ickes. Climb Mt. Ickes and follow the ridge west and then south over the next two summits. Descend into the basin southeast of Arrow Peak via the southwest ridge of Peak 3891. Optionally summit Arrow. Continue to Bench Lake and follow the use trail back to the JMT. North on the trail until you cross the north branch of the South Fork Kings River. Leave the JMT and head down the Kings River into Muro Blanco. There is a faint and intermittent use trail for the first mile or so. Travel down through fabulous Muro Blanco until you reach the Wood’s Creek Trail just upstream of Paradise Valley. Finally, back out on trail to Road’s End. Disclaimer: Do not rely on our exact tracks for your route; use skill and common sense. Use the stated distances as guidance; various sources of trail distances rarely agree. We strongly recommend that anybody engaged in cross-country travel in the Sierra use RJ Secor’s book for more detailed route descriptions and difficulty levels. This trip reminded us again just how deserted the Sierra is once you leave the JMT and its feeder trails. We saw nobody while we were off trail. Gardiner Basin is very wild and dramatic with the imposing peaks of Mt. Cotter, Mt. Gardiner, and Clarence King rising steeply above you. White Canyon is remote, untraveled and unlike any place else we had seen in the Sierra. The route is suitable for backpackers with excellent cross-country skills. We do not recommend it for beginners, particularly since the cross-country stretches are long and very remote. The Muro Blanco itself is one of the finest canyon descents we have done in the Sierra. It is beautiful, remote, empty of people and surprisingly straightforward to travel through. We did this late in the season hoping that the water level in the Kings would be down. Earlier in the year, the water level is likely to be higher and the descent would be more challenging as crossing the river repeatedly helps avoid thick vegetation. Muro Blanco had far fewer brush problems than the Enchanted Gorge/Goddard Creek route down to the Middle Fork Kings. There is no trail through Muro Blanco. At the east end of the canyon, there is a faint use trail that comes and goes and ultimately leads to the old abandoned trail over Cartridge Pass. The original JMT crossed Cartridge Pass prior to being moved to Mather Pass. Below the Cartridge cut-off, the trail disappears. We didn’t see any ducks (cairns, stacks of rock) in Muro Blanco; please don’t despoil the canyon by building any and if you happen upon one, knock it down. The most difficult section of brush is just prior to reaching the Wood’s Creek Trail. We found that by crossing the river and/or moving upslope we could avoid most brush in the main portion of the route. There are several large boulder fields created by rockslides that have to be crossed. Be careful, as some of the rocks in these obstacles were unstable. It is unlikely that you will encounter other people in Muro Blanco. However, once you exit the canyon, you will on the very popular Wood’s Creek portion of the Rae Lakes Loop. A permit is required. Since portions of the route are on the extremely popular Rae Lakes Loop, obtaining the permit could be a little difficult. We got ours by being first in line at the Ranger Station at Road’s End.